Chris and Andz from AYAB who joined us at our stand “Hack the Knit” at the Fosdem, a two day event to promote the widespread use of free and open source software. Workshop at w.o.l.k.e (Brussels) given with Wendy Van Wynesbergh. We showed the different hacks of knitting machines and look at potential problems in the hacks of the machines. We hacked kh 930 & Kh 910 brother knitting machines with AYAB shields and kh 940 with FTDI câbles and Knittington. Chris and Andz from AYAB who joined us in the evening and gave us good tips and technical information for debugs as well as some deeper knowledge on how these machines work.. 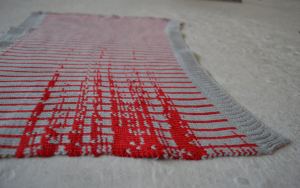 Invited to give an introduction course on Textiles & Programming – open source tools for textiles and knitting machine hacking workshop at L’Académie royale des beaux-arts of Brussels in the Master class of knitting design. I’m making a special production of knitted glitch scarves and algorithmic knitted patterns for the KIKK market in Namur, Belgium. They will be sold at the KIKK market and i will make demos of the hacked knitting machine too! We also started to experiment further with the idea to integrate sound by knitting speakers and using conductive thread in the sound pattern so that the textile would act like an antenna as you approach it and hear the orginal music recording of the pattern. – Showing different kind of glitches playing with file formats and tricking software (Raw format, Photoshop, Audacity..)We did some experimenting also with processing to create computer generated patterns. And finally changing an image to a knitting pattern so that it can be knitted from the hacked knitting machine. The knitting machine herself gave some glitches to the knits! Un workshop autour des pratiques textiles associées avec des outils numériques libres (Floss – en soft et hardware). Nous utiliserons une machine a tricoter hackée avec l’outil /Knitic/. En la connectant avec un ordinateur, la machine devient une sorte d »imprimante textile. En parallèle nous transformerons un textile en surface conductible afin de l’utiliser comme clavier d’ordinateur. Incluant Make my Makey Makey Myself!